1 By the way, is the blonde's name pronounced "fayt" or "fah-teh"? 2 Her name is フェイト, so it'd be the former. 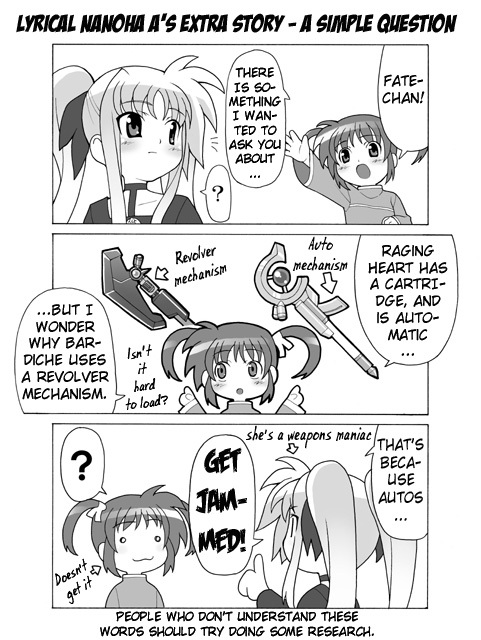 It's pretty clear that Nanoha can be classified as MAGICAL MECHA (e.g. the arcane magic replaces arcane mecha attributes). I can't wait. 9kb generated in CPU 0.02, elapsed 0.0484 seconds. 30 queries taking 0.0357 seconds, 52 records returned.